Mehandi has its origin in India where the extracts of the plant Henna is used to create such majestic designs in various parts of the bodies. Though largely used on the palms of the hands, latest mehandi designs are also applied on feet and other body parts. This art form is witnesses in all over the Asian subcontinent in occasions and sometimes without it. The ritual ceremony regarding mehndi is followed in every part of India, mostly in marriages where the bride is adorned with beautiful and majestic latest designs of mehndi. Though the fascination of designing body parts with mehndi in India has been introduced in the 20th century, this beautiful patterning is gaining its popularity in the present decade as it has now become a fashion icon. But if you are repeating the same mehndi design this year or the 2016 mehndi designs then it is the high time to change it and to make yourself the new hip and happening of 2017. Each year the fashion trend change and so do the latest mehndi designs. You need to keep up with it as flaunting your beauty but with accurate fashion sense is essential. The evolution of bridal mehndi has also changed through the past couple of years. So, before applying any design, make sure you are familiar with the latest mehndi design of 2017. Before giving you the latest mehndi designs of this year, I would like to make you familiar with the types of it. The Middle Eastern or Arabic designs. Clearly, a wide variety of mehndi design is available, but this year only a few have made it to the top list. Arabian mehndi patterns have acknowledged by many and still making it to the top list like the last year. The best part of these Arabic mehndi latest designs is that they are easy to craft yet has the most glamorous look. As mehndi patterns are the reflection of the culture, geography and the history of the place, the Middle East Mehndi designs are the combination of leaves, flowers, and vines. Unlike the Indian mehndi design, these patterns are less dense and mostly decorative outlines. Check this video out for the basic idea of the Arabic Mehndi designs. Pakistani Mehndi designs are unique in their nature and easily identified through the combination of thick and thin lines in crafting the right balance of flowery, paisley and geometric designs in the mehndi. The Pakistani style mehndi hands stand out from the crowd because of its clear yet elegant styles. Try these designs for pre-wedding ceremonies. These are also suitable for various ritualistic ceremonies including Karva Chauth. The Pakistani and Indian Mehndi patterns often switch their place in the top list as both are equally august. As Indian culture is packed with variety, the Indian Mehndi patterns are very dense and complex in nature. The main designs that are used in the Indian Mehndi, are the complex pattern of peacocks, lotus flowers, unique curls, and curves that are often known as batik design. Tear drops and banyan leaves are also used in the latest mehandi designs. The accumulation and the combination of the mehndi patterns of both Indian and Arabic form the Indo Arabic Mehndi designs. The main theme of the mehndi is the flowers with beautiful curves. 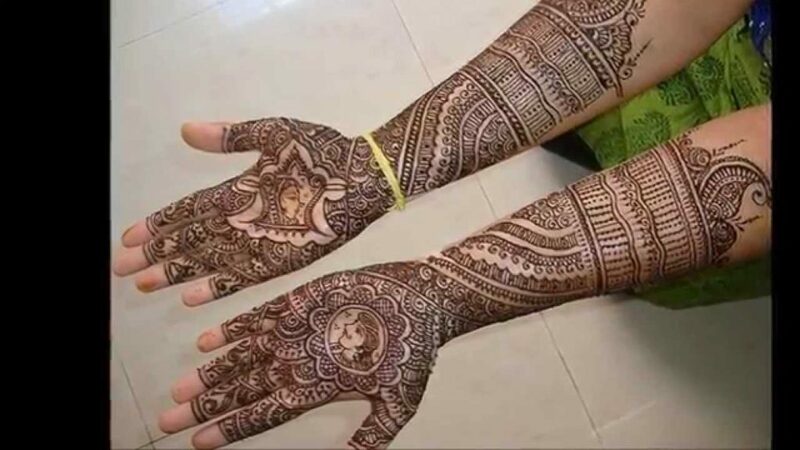 All the designs of this pattern are done in thick outlines which make it look like dense, though in real the mehndi is less dense than the Indian style and denser than the Arabic Mehndi pattern. These particular designs, latest this year has no rules. Bridal Mehndi designs can be the combination of many patterns. The bride can fill her hand with loads of designs whichever looks beautiful. Largely dense mehndi patterns are the most sought-after choices for the brides. The fashion world believes in glitter mehndi. The designs mainly include flowers and leaves with multiple curves. Glitter is used to make this patterns look hotter. These mehndi patterns sometimes evoke both boldness and seductiveness. Our top 7 list of latest mehandi designs ends with the Moroccan Mehndi Designs. These are the most different styles and only based on dense geometric shapes and sizes. Though easier to craft but for some novices, it may look a bit complex. These patterns are not only for occasions, you can try them out on normal days also. These seductive designs are the legacy of every girl.